Research on the comprehension of human-given cues by domesticated as well as non-domesticated species has received considerable attention over the last decade. While several species seem to be capable of utilizing these cues, former work with domestic pigs (Sus scrofa domestica) has shown inconclusive results. In this study, we investigated the use of human-given cues in an object choice task by young domestic pigs (N = 17; 7 weeks of age) who had very limited human contact prior to the experiments. Subjects had to choose between two bowls of which only one was baited with a reward. Over the course of five experiments, pigs were able to use proximal and, with some constraints, also distal pointing cues presented in both a dynamic-sustained and in a momentary manner. When the experimenter was pointing from the incorrect bowl towards the correct one, most of the subjects had problems solving the task—indicating that some form of stimulus/local enhancement affected pigs’ decision making. Interestingly, pigs were able to utilize the body and head orientation of a human experimenter to locate the hidden reward but failed to co-orient when head or body orientation of the experimenter was directed into distant space with no bowls present. Control trials ruled out the possibility that other factors (e.g. odour cues) affected subjects’ choice behaviour. Learning during experiments played a minor role and only occurred in three out of twelve test conditions. 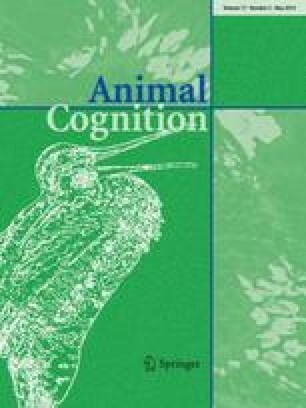 We conclude that domestic pigs, even at a very young age, are skilful in utilizing various human-given cues in an object choice task—raising the question whether pigs only used stimulus/local enhancement and associative learning processes or whether they were able to comprehend the communicative nature of at least some of these cues. The online version of this article (doi: 10.1007/s10071-013-0702-3) contains supplementary material, which is available to authorized users. We would like to thank the two reviewers for their detailed comments on the manuscript. The experiments were carried out at facilities of the Institute of Agricultural and Nutritional Sciences of the University of Halle-Wittenberg under licence of the regional veterinary control board. Housing facilities met the German welfare requirements for farm animals.